DENTON – What a start to a season of high expectations. “We still have a lot of work to do,” North Texas coach Seth Littrellsaid. “I was proud of the way our guys competed for four quarters. I felt like in all three phases we were competitive and dominated. The Mean Green have led by 20 or more at intermission of both games this year, and, coupled with the 46 points scored a week ago, has scored 104 points this year – the most points scored in the first two games in UNT history. The defense, meanwhile, followed its throttling of SMU a week ago by holding UIW to just five first-half first downs while coming up with three first-half takeaways, including defensive back Kemon Hall’s second interception in as many weeks. 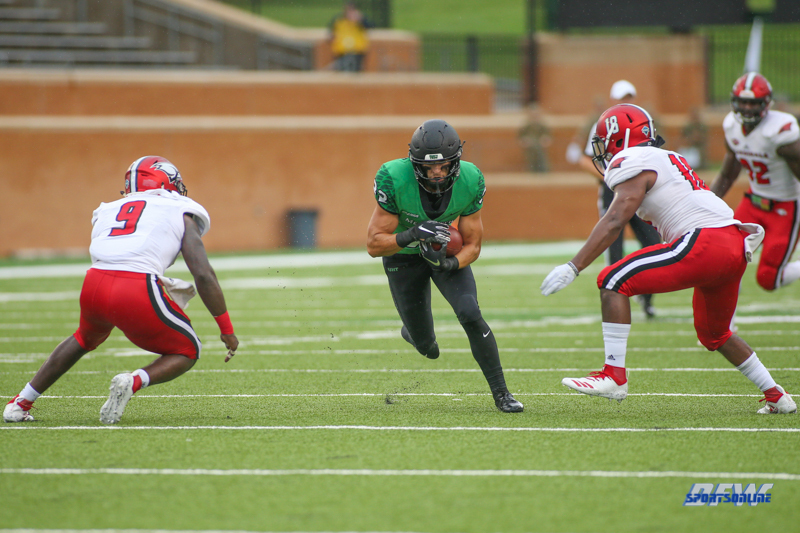 North Texas held an opponent to under 300 yards for the second week in a row, this time against an opponent that amassed 566 yards total offense in its opener against New Mexico. Linebackers E.J. Ejiya, Brandon Garner and Jamie King led the Mean Green assault, combining for 21 tackles, seven for loss. The defensive performance was marred only a 55-yard touchdown run by UIW’s Ra’Quanne Dickens, who pulled Cardinals within 10-6 late in the first quarter. That, however, was UIW’s last flirtation with challenging the Mean Green. North Texas out-scored UIW 31-0 in the second period to put the game away.